Eighty percent of American voters favor national standards that would limit calories, fat and sodium in snack and à la carte foods sold in U.S. schools and encourage the consumption of fruits, vegetables, and low-fat dairy items, according to a new poll commissioned by the Kids’ Safe & Healthful Foods Project, a joint project of The Pew Charitable Trusts and the Robert Wood Johnson Foundation. The U.S. Department of Agriculture is expected soon to propose such updated standards. The standards likely will apply to snacks and beverages—such as sugary drinks, salty snacks, pizza, ice cream, and french fries—that can be purchased from vending machines, school stores, and cafeteria à la carte lines. The standard that applies to them now is 30 years old and does not reflect current nutrition science. During a typical school day, four in 10 students purchase and consume snack foods or beverages, and such foods are often high in fat, sodium, and calories. Additionally, students’ access to snack foods and beverages has increased over the past decade. The availability of vending machines in middle schools has more than doubled since the 1990s, and in the 2009-2010 school year, nearly half of the nation’s elementary school students could buy unhealthy snack foods at school. Eighty-three percent of voters said they think that food sold in school vending machines is not really healthy/nutritious or only somewhat healthy/nutritious, compared with just five percent who think that vending machine food is totally/mostly healthy and nutritious. Sixty-eight percent of voters said they think that food sold in cafeteria à la carte lines is not really healthy/nutritious or only somewhat healthy/ nutritious, compared with 21 percent who think that it is totally/mostly healthy and nutritious. Sixty-eight percent of voters said they think that food sold in school stores is not really healthy/nutritious or only somewhat healthy/nutritious, compared with 10 percent who think that it is totally/mostly healthy and nutritious. Eighty percent of American voters favor national standards that would limit calories, fat and sodium in snack and à la carte foods sold in U.S. schools and encourage the consumption of fruits, vegetables and low-fat dairy items, according to a new poll commissioned by the Kids' Safe & Healthful Foods Project, a joint project of The Pew Charitable Trusts and RWJF. 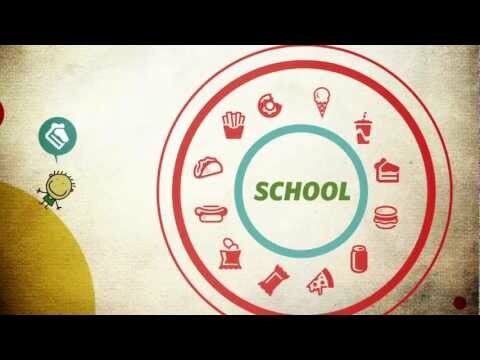 This brief video explains the impact these foods and beverages can have on kids' health and how policy-makers are trying to make sure schools provide kids with healthy foods and drinks.